Simply connect the headset to the computer and it is ready for use. 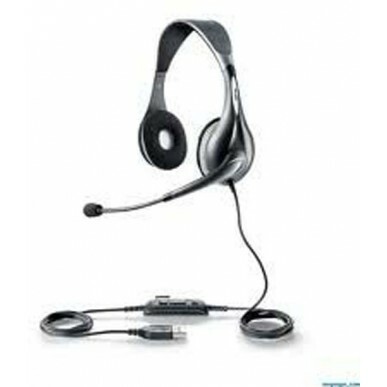 The intuitive call-control unit attached to the cord allows for fast user adoption.The headset features superior sound clarity for softphone calls, conference calls, live presentations and other multimedia applications. The microphone includes a noise-reduction feature, ensuring that the recipient cannot hear background noise from the speaker’s surroundings. Please bear in mind when deciding which headset to purchase, that in headsets, just as in the rest of life - you get what you pay for. functional with the latest generation of softphones. The Skype/Lync functions work seamlessly and the headset works right after plugging them in to USB on your laptop. Cord length is generous but not too long. Sensitivity is high so you don't need much volume (I use about 15% volume). The corded buttons work fine with clear indications of mute and being in a call. Voice is very much crystal clear in both directions. Only downside is they don't grip my head very tight, and can tend to tip forward when I look down at my keyboard. Otherwise excellent for Skype/Lync calls indeed.